Grid Computing for Everyone designed to run the next generation AI more effectively. Grid computing is the use of widely distributed computer resources to reach a common goal. The grid can be thought of as a distributed system with non-interactive workloads that involve a large number of files. Grid computing is distinguished from conventional high-performance computing systems such as cluster computing in that grid computers have each node set to perform a different task/application. Grid computing combines computers from multiple administrative domains to reach a common goal, to solve a single task, and may then disappear just as quickly. Grids are a form of distributed computing whereby a “super virtual computer” is composed of many networked loosely coupled computers acting together to perform large tasks. For certain applications, distributed or grid computing can be seen as a special type of parallel computing that relies on complete computers (with onboard CPUs, storage, power supplies, network interfaces, etc.) connected to a computer network (private or public) by a conventional network interface, such as Ethernet. This is in contrast to the traditional notion of a supercomputer, which has many processors connected by a local high-speed computer bus. The size of a grid may vary from small—confined to a network of computer workstations within a corporation, for example—to large, public collaborations across many companies and networks. “The notion of a confined grid may also be known as an intra-nodes cooperation whilst the notion of a larger, wider grid may thus refer to an inter-nodes cooperation”. Grid sizes can be quite large. Although a single grid can be dedicated to a particular application, commonly a grid is used for a variety of purposes. Coordinating applications on Grids can be a complex task, especially when coordinating the flow of information across distributed computing resources. Grid workflow systems have been developed as a specialized form of a workflow management system designed specifically to compose and execute a series of computational or data manipulation steps, or a workflow, in the Grid context. The Grid depends on the computer and communications networks of the underlying internet, novel software allows users to access computers distributed across the network. This software is called “middleware” because it sits between the operating systems of the computers and the business intelligence applications software that can solves a user’s particular problem. Grid middleware is a specific software product, which enables the sharing of heterogeneous resources, and Virtual Organizations. It is installed and integrated into the existing infrastructure of the involved company or companies and provides a special layer placed among the heterogeneous infrastructure and the specific user applications. Utility computing is referred to as the provision of grid computing and applications as service either as an open grid utility or as a hosting solution for one organization or a VO. Grid-enabled applications are specific software applications that can utilize grid infrastructure. This is made possible by the use of grid middleware, as pointed out above. Software as a service (SaaS) is “software that is owned, delivered and managed remotely by one or more providers.” Additionally, SaaS applications are based on a single set of common code and data definitions. They are consumed in a one-to-many model, and SaaS uses a Pay As You Go (PAYG) model or a subscription model that is based on usage. Providers of SaaS do not necessarily own the computing resources themselves, which are required to run their SaaS. Grids and Cluster can provide a SaaS the platform they need to develop new business models. 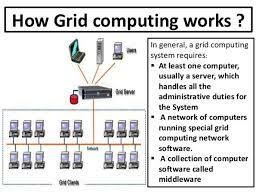 We Offer both Grid and Cluster Computing. Cluster are really good for CPU intensive operations. A computer cluster is a set of loosely or tightly connected computers that work together so that, in many respects, they can be viewed as a single system. 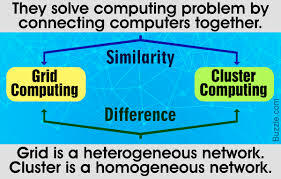 Unlike grid computers, computer clusters have each node set to perform the same task, controlled and scheduled by software. The components of a cluster are usually connected to each other through fast local area networks, with each node (computer used as a server) running its own instance of an operating system. Clusters are usually deployed to improve performance and availability over that of a single computer, while typically being much more cost-effective than single computers of comparable speed or availability. Computer clusters emerged as a result of convergence of a number of computing trends including the availability of low-cost microprocessors, high-speed networks, and software for high-performance distributed computing. They have a wide range of applicability and deployment, ranging from small business clusters with a handful of nodes to some of the fastest supercomputers in the world such as IBM’s Sequoia. Prior to the advent of clusters, single unit fault tolerant mainframes with modular redundancy were employed; but the lower upfront cost of clusters, and increased speed of network fabric has favoured the adoption of clusters. In contrast to high-reliability mainframes clusters are cheaper to scale out, but also have increased complexity in error handling, as in clusters error modes are not opaque to running programs. We can provide a client with their own cluster or usage on other servers. There are several advantages to using clusters compared to using regulars servers. Distributed process across several servers not only provides enhanced performance but also redundancy across different servers and ever across geography. Clusters are primarily designed with performance in mind, but installations are based on many other factors. Fault tolerance (the ability for a system to continue working with a malfunctioning node) allows for scalability, and in high performance situations, low frequency of maintenance routines, resource consolidation(e.g. RAID), and centralized management. Advantages include enabling data recovery in the event of a disaster and providing parallel data processing and high processing capacity. Clusters provide scalability in their ability to add nodes horizontally. This means that more computers may be added to the cluster, to improve its performance, redundancy and fault tolerance. This can be an inexpensive solution for a higher performing cluster compared to scaling up a single node in the cluster. This property of computer clusters can allow for larger computational loads to be executed by a larger number of lower performing computers. When adding a new node to a cluster, reliability increases because the entire cluster does not need to be taken down. A single node can be taken down for maintenance, while the rest of the cluster takes on the load of that individual node. If you have a large number of computers clustered together, this lends itself to the use of distributed file systems and RAID, both of which can increase the reliability and speed of a cluster.